I think Vortex is one of the more a forward looking companies in this business and the pace with which they have been growing is pretty impressive. I think their product strategy for a bit looked somewhat like a shotgun blast: fire off a bunch of new products at the market and see what sticks. It worked adequately and they came up with a good product range, but thankfully, it looks like they are moving past. Their product line-up looks reasonably coherent and logical to me, except for a few outliers. I wonder if those will develop into separate product lines or remain single product experiments. 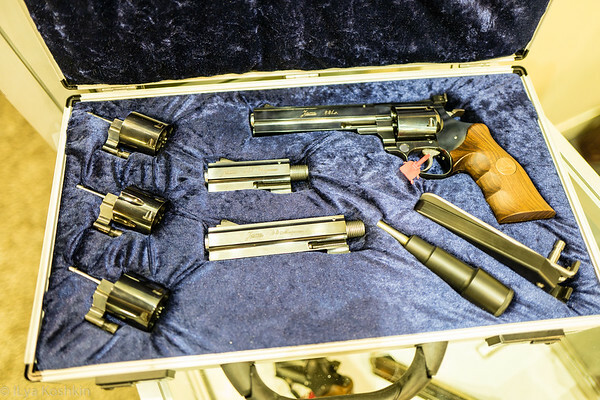 Vortex has converged on four discreet quality levels for their products: Razor (made in Japan and/or USA), Viper (made in Phillipines), Diamondback (made in Phillipines) and Crossfire (made in China). 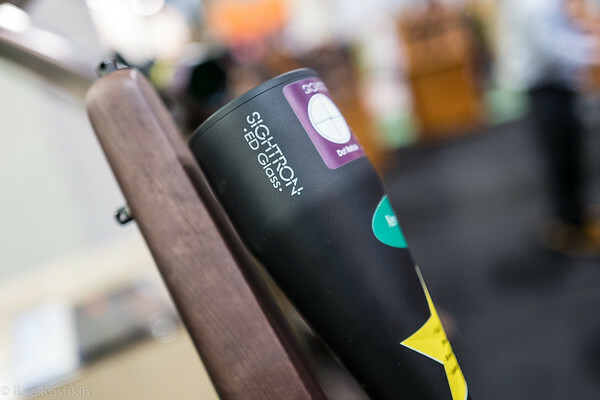 For conventional riflescopes, this gradation stays consistent for both tactical and hunting products and for all four product levels, Vortex offers very compelling alternatives to other brands. 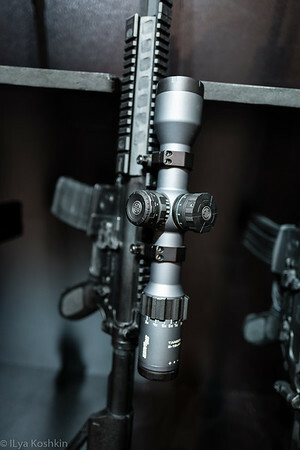 With riflescopes, the outliers are Golden Eagle target scope and Strike Eagle low range variable. These are very different kinds of eagles with the Golden Eagle being more or less at the Razor-level of performance, while the Strike Eagle is a “me too” OEM product. I am a little surprised they didn’t call the Golden Eagle “Razor F-Class” and be done with it, so I wonder if it will spawn another product family. With red dots, the naming is sorta all over the place, but it almost seem like they are beginning to clean that up as well. There is a pretty nice Razor reflex sight and a new Razor AMG UH-1 holographic sight that sit at the top of Vortex’s non-magnified sight line-up. 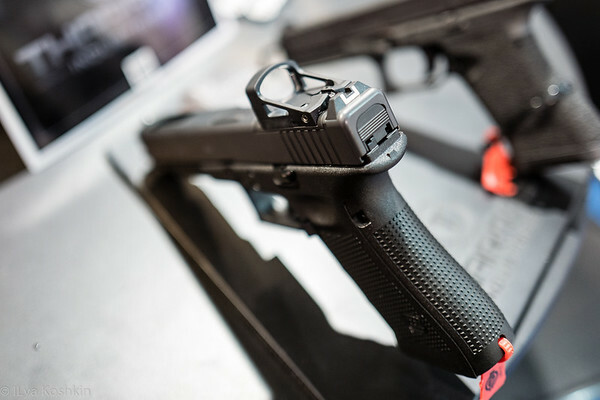 With the tube-style red dot sights, the original Strikefire is still there and somewhat more recent Sparc and Sparc AR. All are pretty compelling products for their price ranges, although I will freeley admit to liking Sparc AR a lot more than the other two. With compact reflex sights, in addition to the previously mentioned Razor, there are the Venom and Viper. They cost about the same, but use different batteries, Venom has a top loading battery and slightly larger lens. Viper needs to be removed from its mount to change the battery, which may effect zero. I do not fully understand why I would choose one over the other (in my case, why I would choose Viper over Venom), so I am curious to see how Vortex will work this out. Lastly, there are the Spitfire prism sights. I am not sure where they fit in the Razor-Viper-Diamondback-Crossfire continuum. 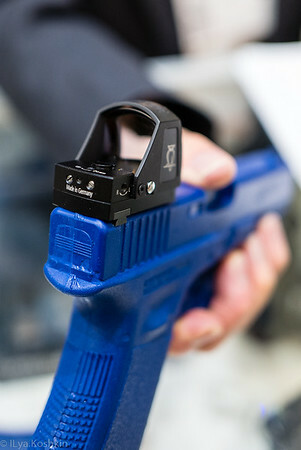 Generally, with Razor products, the only new offering is a very interesting looking holographic sight. I liked what I saw and I plan to test one. 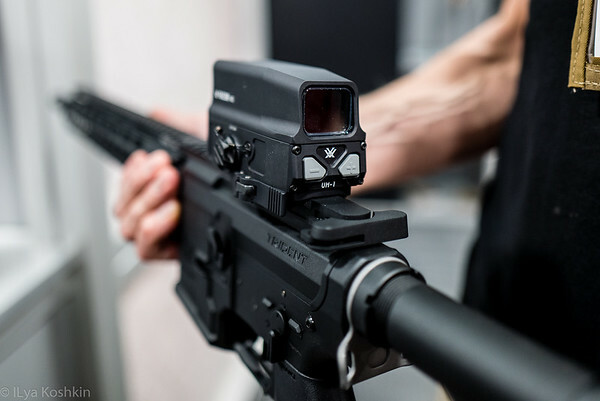 This is an interesting time to take on EOtech and I think Vortex will do well with this one. The optical design looks to be a little simpler from alignment standpoint than EOtech, so I do not expect it to have thermal stability issues. Controls are pretty straightforward with two pushbuttons on the back of the sight. I am a bit mixed on that since accessing them when used with a magnifier could be a bit difficult. 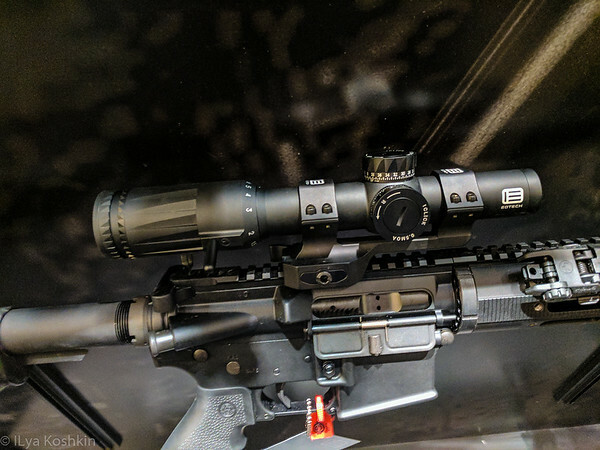 Generally, magnifier use is one of the advantages holographic sights have over reflex style red dots, so I spent some time trying to convince Vortex to make a high quality magnifier for the UH-1. We’ll see if they do it. They did have the UH-1 set up with the VMX3 magnifier (which I just tested with Sparc AR) and while it is a very respectable magnifier and good for the money, I do not think it is quite good enough for the UH-1. However, in the picture to the left, you can see how accessing the controls could be a bit problematic. Lastly, since all holographic sights have a significant battery life disadvantage compared to reflex sights, I was happy to see a rechargeable battery option. The rest of the Razor line is unchanged for now and, honestly, that is a good thing. These are excellent scopes. 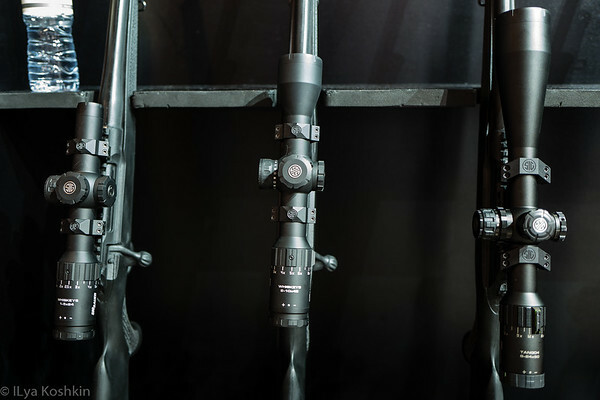 Razor HD LH has become my go to recommendation for hunting scopes (I think they will adda model or two to it next year) and Razor AMG is still almost impossible to get due to all the backorders. Razor Gen II in the meantime soldiers on as one of the more compelling general purpose precision scopes out there. I think the decision to round out the Razor line-up with an American-made quick acquisition sight is a good one. Aside from that, the Razor HD spotters are new(ish) and I am testing the 65mm model. It is very good. 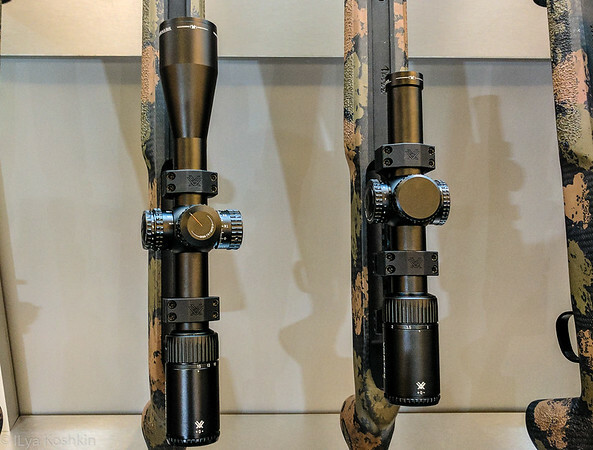 Viper product family probably had the biggest splash in the Vortex booth this year, since the PST riflescopes were redesigned. They are still made in the Phillipines, but by a different maker. The new models are 1-5×24, 2-10×32, 3-15×44 and 5-25×50. They all sport a new larger eyepiece and they are a bit heavier than their predecessors. 1-5×24 is a SFP model only, while the others are available as both FFP and SFP. 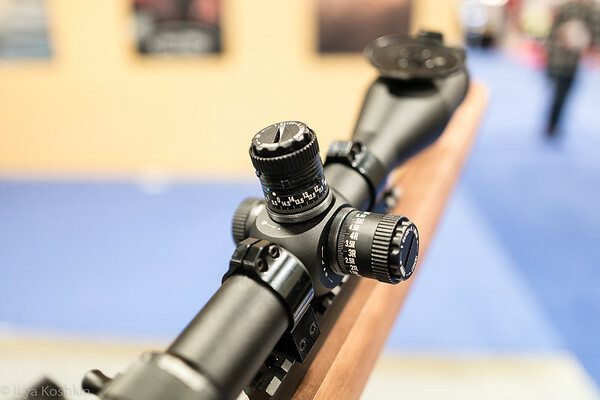 The reticles are well conceived and are generally similar to those in the Razor scopes, so someone who uses a Razor on a primary rifle can put a new PST onto a trainer and feel right at home. The three higher magnification scopes now sport a proper zero stop similar in operation to Gen 1 Razor. They seemed like well designed scopes at SHOT and I suspect they will be a meaningful improvement over the original PST. The big question, of course, is whether they will compete well against all the scopes that were designed to compete against he original PSTs. That question I can not easily answer without doing a proper test. 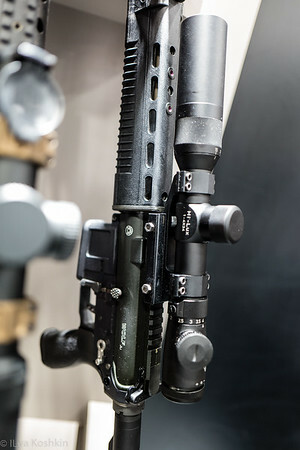 The Gen 2 PSTs run between $700 and $1100 depending on the model, so they are a bit more expensive than the original ones and go head to head against Burris XTR II and a few others, most notably Athlon Ares and Midas (2.5-15×50 and 4.5-27×50), as well as Hi-Lux Phenom HD 6-30×56 and PentaLux 4-20×50. There are others, of course, but one of the things I am really curious about is whether the better-made Chinese scopes from Athlon and Hi-Lux can compete adequately well (and consistently enough) against the better-made Phillipine scopes like the PST Gen II and XTR II. Once I work that out, the next question will be how well they stack up against Japanese competition like Sightron S3 and some of the US competition like Leupold VX3i LRP. Basically, I am going to have a lot of fun with this, since this is the price range I want to look at this year. Among the PST Gen 2 scopes, the 3-15×44 and 1-5×24 seemed to be the best ones of the bunch based on a rather cursory look, so I will start with the 3-15×44. Interestingly, with the original PSTs, the 2.5-10×32 was the best optimized model, followed by the 6-24×50, while the 2.5-10×44 was the runt of the litter. We’ll see if my original impressions of the Gen 2 are correct. Rounding out the Vortex news, they introduced a tactilized version of the Diamondback with a ranging reticle and exposed turrets. 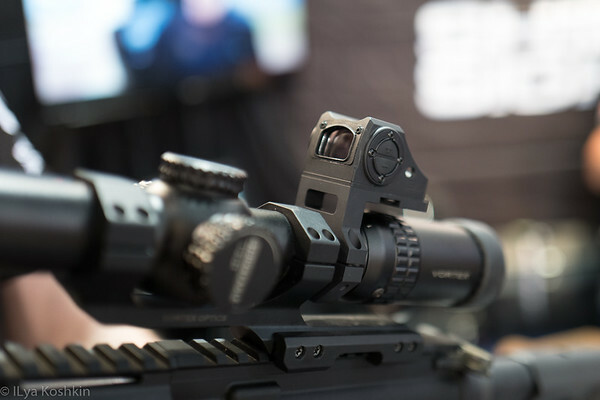 I like Diamondback scopes, but unless there is a lot of interest I will likely skip this one over: it only comes with MOA turrets and I really prefer mrad. Lastly, Vortex now has a rangefinding binocular called Fury HD. I wasn’t terribly impressed with how it looked, but then again, at around $1200, it is about half the price of the LRF binos I like. In other words, as far as LRF binoculars go, I am both spoiled and picky. I will look at it if time allows, but I have a suspicion that these will be difficult to come by for a bit, so a test may have to wait. All of these will be in the $500 to $900 range, which makes them fairly accessible. Hi-Lux makes a lot of other stuff as well, but most of it has been around for a bit and I do not have enough time to look at everything. I will, however, mention the MM2 (Micro-Max 2) red dot sight that I have failed to break for a number of months now. It is probably my favourite of the sub-$300 tube-style red dot sights (and is one of the reasons I have not bought an MRO). The new CMR8 is of particular interest to me since late last year, Hi-Lux asked for some ideas on a reticle for the CMR8. They already had a very nicely executed internal design, but they wanted another option. I am perpetually dissatisfied with most of the reticles out there, this was an opportunity for me to try a design that I like. I suggested a few things and they implemented most of them and added a couple of other things that appealed to them. I will talk a bit more about this reticle in future articles. At SHOT was the first time I saw it live and I think it is going to work well for my purposes. I took a couple of blurry handheld pictures at 1x and at 8x, so you can see what it looks like. I will do better photography when the first production scopes get here. My basic design concept was to have a large out horseshow that is outside the FOV at 8x, but salmost serves a ghost ring at 1x. 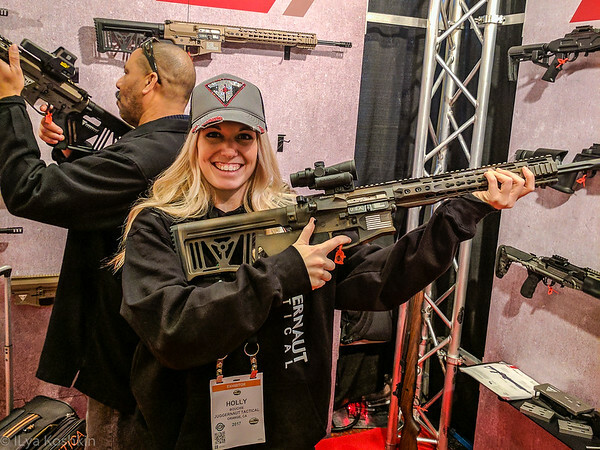 At 8x, the smaller 10 mrad horseshow is the dominant feature designed to draw the eye to its center where there is a mil-scale and a small mrad-grid array that serves as elevation, wind and lead holds for typical 5.56, 6.5Grendel or 7.62×51 load out to 500-600 yards without the need to twist the turrets. The grid can also be used for quick rangefinding which I will cover in more detail later. However, the primary rangefinding features are the choke style rangefinders for both horizontal and vertical targets 1m and 1.75m in size. Aside from the reticle, the scope looked pretty well executed, but I will reserve judgement until I get a production unit and properly test it. The turrets are easily finger-adjustable with 0.1 mrad clicks. You can keep them exposed without any undue effects, but I prefer to run scopes like this type primarily with the reticle, so the included turret covers suit me well. The illumination starts at a couple of night vision compatible settings one one end and gets pretty bright on the other end. I am not convinced it will be day bright at 1x, but the reticle is designed to be very visible regardless. I will work it out for a range of lighting conditions once it gets here. Overall, the scope is fairly compact at only 10″ of length and at 22 ounces is not overly heavy for a 1-8x design. Field of view looks to be impressively wide and eye relief is longer than on the CMR4. The new Uni-Dial seems to be a new design and since I liked those programmable turrets originally, I will definitely test this one as well. The turrets seemed to have decent feel and tool-less reset. 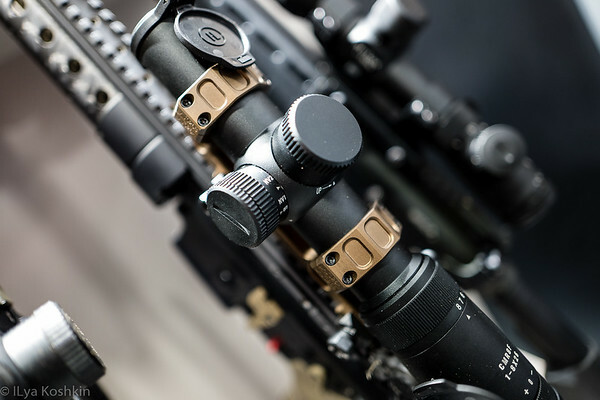 These days, many companies offer custom engraved turrets for their scopes. Uni-dial’s customizable nature approaches the same problem from a different angle. I suspect that the new Uni-Dial and Phenom HD are related design differing in reticle location and perhaps a few other design specifics and aesthetic features. The turrets are clearly different between the two with the Phenom being ore of a traditional precision scope design with knurled exposed turrets. Both offer a removable cat-tail for quick magnification adjsutments. 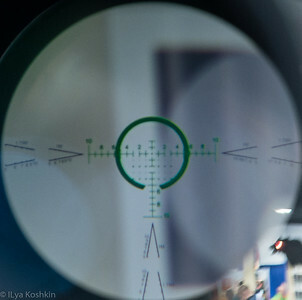 The FFP reticle in the Phenom is a mil-grid style (along the same lines as Sig’s DEV-L, some Horus designs and many others) and generally this scope’s feature set is pretty ambitious. 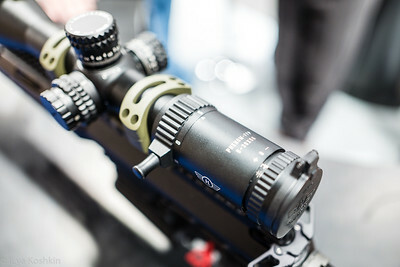 I think the Phenom and Uni-Dial will be the first of Hi-Lux’s new scopes I look at. With the CMR8 and the new competition scope following suite in late spring some time. As I mentioned earlier, between Hi-Lux and Athlon it looks like Chinese-made designs are really coming of age. Hi-Lux’s Phenom HD and CMR8 are ambitious designs, but if they are executed well could be a pretty major deal simply because of their sub-$1k price. 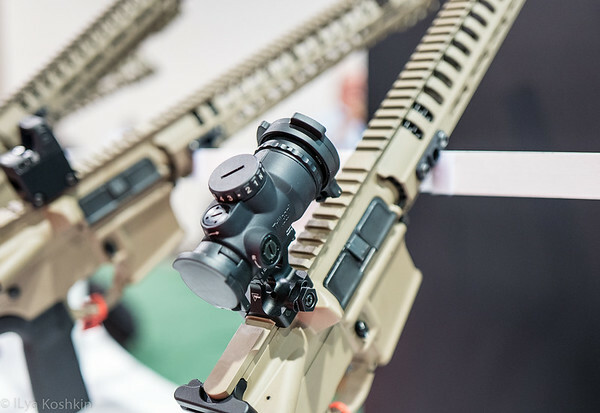 The CMR4-based competition scope is fundamentally a direct response to the change in the service rifle competition rules that now allow magnified optics of no more than 4.5x of magnification and no more than 34mm objective. 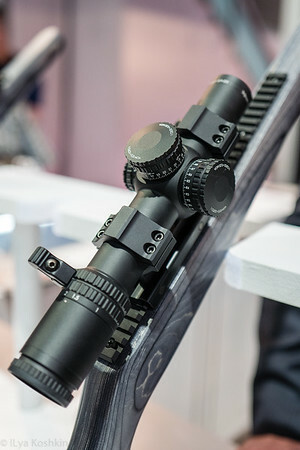 Bother March and Nightforce came out with scope specific for this competition, but both are expensive at $1900 for the Nightforce and well over $2k for March. I am sure they are exceptional, but I was curious to see what will be out there that is a bit more affordable. Well, this is an interesting design that will be far cheaper. Best I can tell, it is the regular CMR4 with the objective lens bumped up to 34mm and adjustable configuration to dial out parallax. The reticle is a fairly clean MOA-based design. Now that the rules allow for optics, I have been thinking about trying the service rifle competition. My original plan was to simply use my Elcan Spectre OS, but perhaps I will experiment with this one as well. Honestly, I think it is a clever way to quickly get a product to market using a proven platform. Similarly importantly, this is probably the largest objective for a low range variable scope out there. I am very curious to see how it does. At 4x, with a 34mm objective, this scope should have far better low light performance than most similar low range variable designs. 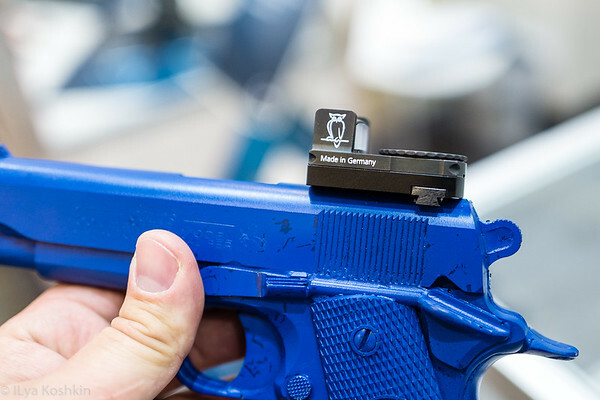 While Hi-Lux was thinking of service rifle competition when they came up with this, I can think of a variety of other applications where it can do well. I would like to start this with a formal complaint: I take my sweet time when I test precision riflescopes. After months of messing with it, I finally concluded that I really like Sig’s Tango6 scopes. 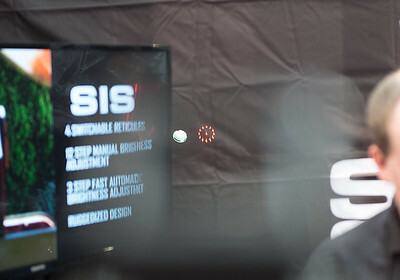 Naturally, Sig responded by introducing an entirely new Tango6 line-up. The 1-6×24 is not too different, except the tall turrets I did not like are gone, replaced with covered low and wide knobs. It is also the only one with a 30mm tube. The rest are 34mm. The 3-18×44 got much shorter and noticeably fatter. It is now about the same length as the Leupold Mark 6 3-18×44, but a lot heavier. 4-24×50 is new, while the 5-60×56 appears to be similar to other designs coming from the same OEM (you all know who this is, but Tango6’s product manager seemed sensitive to this, so I won’t say it out loud). Other than the 1-6x, they all have 120 clicks per turn turrets (i.e. 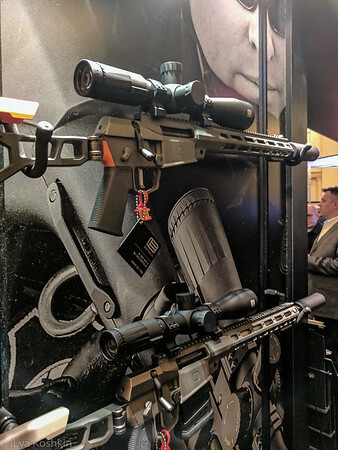 12 mrad for me or some irrelevant number of MOA for the unholy MOA shooters out there…) that also have zero stop and locking capability (pull-up to unlokc, press down to lock). The 1-6×24 might also have that many clicks, but I did not check. 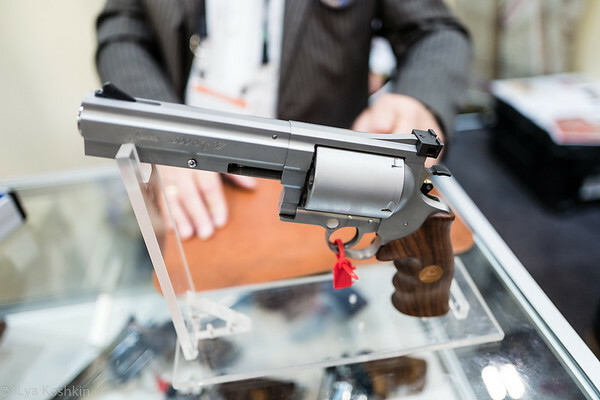 The turret on the 1-6×24 is now eerily similar to the Vortex Razor HD Gen 2 1-6×24. I like all of these new turrets. The feel was good and the feature set is very rich. There is now an electronic level and, importantly for me, there is now a mil-grid Christmas tree stile reticle called DEV-L. For me, that is a big deal. 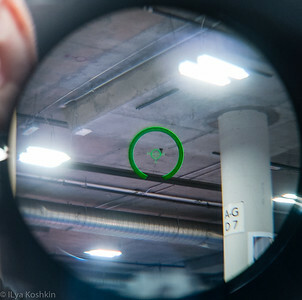 The electronic level has two indicators that appear to be in the reticle plane, that light up when the scope is not level. They eat a little into the FOV, so I am trying to decide what I care about more: FOV or electronic level. I asked Sig to keep me in mind when the 4-24×50 shows up. While in principle a 3-18×44 is more up my alley, the 4-24×50 is only 3 ounces heavier, so I figured I would rather look at that model. Whiskey 5 scopes have gone through an update as well. 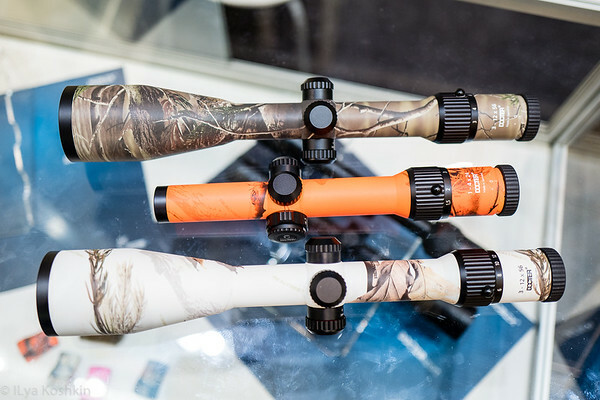 These are Japan-made hunting scopes that are now black in color (apparently the hunting crowd objected to greyish bodies). They also gain the previously mentioned electronic level. They look like fairly well worked out hunting scopes. 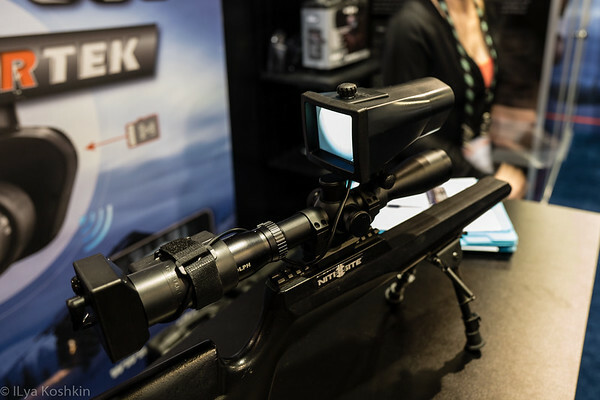 Other riflescope product lines (Tango4 and Whiskey3) look to be reasonably unchanged. Sig’s excellent LRFs get an upgrade in the form of Kilo2200 and Kilo2400. Kilo2200 looks like its predecessor, but get a little more range. 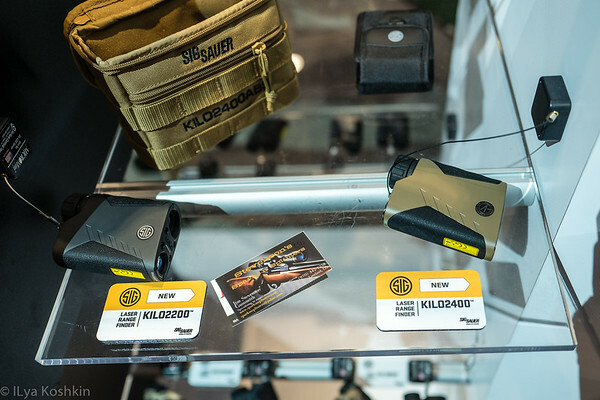 Kilo2400 doubles the price tag and adds a sophisticated ballistic calculator and a wind meter that plugs into your smartphone. Essentially, it is an attempt tog et rid of the Kestrel. I do not spend a whole lot of time looking at LRFs, but this got my interest. 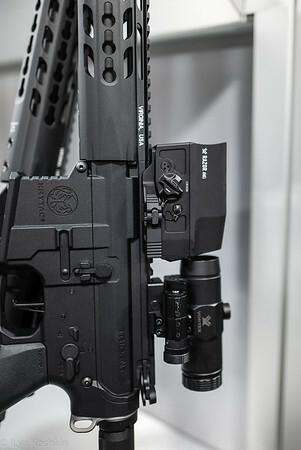 Aside from that, Sig has a new full size red dot sight called Romeo6 that is apparently assembled in the US. It looks like a nice sight, but full-size red dots are not my cup of tea. It does have a solar battery, which I like (I just tested solar powered compact Romeo4). What did peak my interest was the Juliet4 4x magnifier. However, it seemed like it was a rather early prototype. There are not that many truly high quality magnifiers out there, so I am very curious to see what Sig came up with. The pictures are up and a few clips of my recollections as well. I will add some text as time allows.